Delicious baked Chocolate Peppermint Cookies with a Mint Oreo cookie in the middle! ~ Preheat the oven to 350 degrees F. Prepare baking sheets with parchment paper. ~ Add the butter and sugar to the bowl of stand mixer beat on medium high speed until light and fluffy, or 1-2 minutes. ~ With the mixer on the lowest speed, and in eggs one at a time. ~ With mixer off, add in peppermint extract and food coloring. Turn on lowest speed and let ingredients incorporate. ~ In a separate bowl sift together flour, baking powder, baking soda, cream of tartar, and salt. ~ With mixer on low, add flour mixture to wet ingredients. Remove bowl from mixer. ~ Add in all chocolate to dough and mix by hand. Half of the chocolate should be chips (or large chunks) and the other half should be finely chopped. Mix until just combined. ~ Cover the dough and refrigerate for about an hour. ~ Using a medium ice cream scoop, (roughly 1-2 tablespoons) scoop out peppermint cookie dough and set it on top of cookie. Repeat until Oreo\'s all have peppermint cookie dough on them. 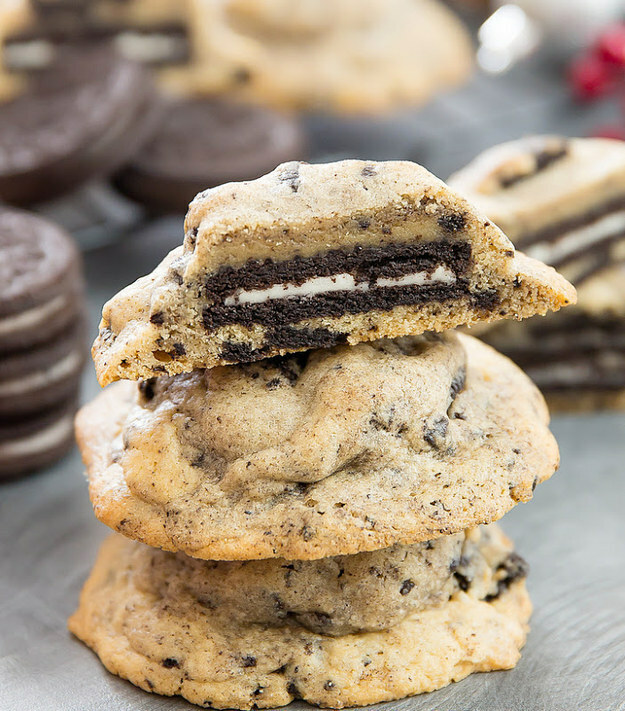 ~ Carefully press the dough around the cookie (trying not to break the cookie) so that all of the Oreo is covered in peppermint cookie dough. ~ Repeat until all of the Oreo\'s are covered. ~ Bake for 8-12 minutes at 350 or until the cookies are JUST starting to brown on the edges. ~ Allow cookies to cool on baking sheet for 5 minutes before removing to a wire rack to cool completely.